Some days Facebook just breaks my heart. Last week a friend who is trying to change his eating habits because, well frankly, his life depends on it, posted a complaint about his breakfast smoothie. He gave the recipe, and yes, it was nasty. 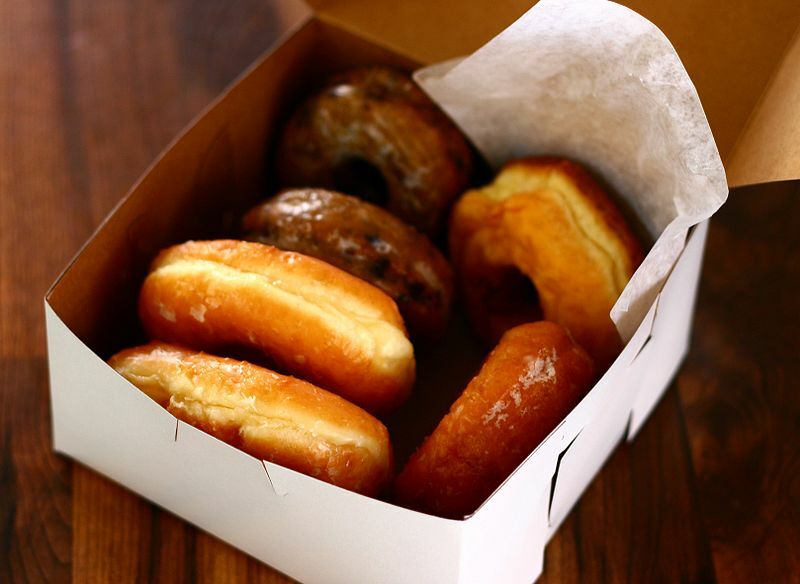 So one of his "friends" said she would bring over some donuts. Another friend posted, I have the best husband! He brought me home an Oreo Blizzard. Her life doesn't depend on it yet, because she is younger. But it will. She is on her way. SAD, the Standard American Diet is an addiction and addictions are progressive. No New Year's Resolutions -- Change Your Life started us off with how excess weight is killing people in the US and slaughtering those of us with mental illness, who have the same life expectancy as the people of Sudan. The Stages of Change and Weight Loss introduced a model for changing habits. Nobody needs another die-t. We need a change. My Food Autobiography and the Stages of Change began tracing how the stages work, the kind of thoughts that define the first two stages, pre-contemplation and contemplation, and how I moved from one stage to the next. 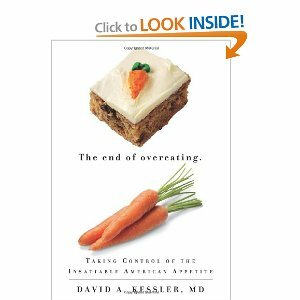 In Changing Food Habits - Contemplation and Preparation, I introduced David Kessler's book, The End of Overeating: Taking Control of The Insatiable American Appetite. Key concepts include endorphins, the loss of the satiety mechanism and detox. Detox is how you become aware in your body of how your current eating habits actually make you feel. Head knowledge has not been enough. I recommend an eating experiment that helped me move from the contemplation stage to preparation. 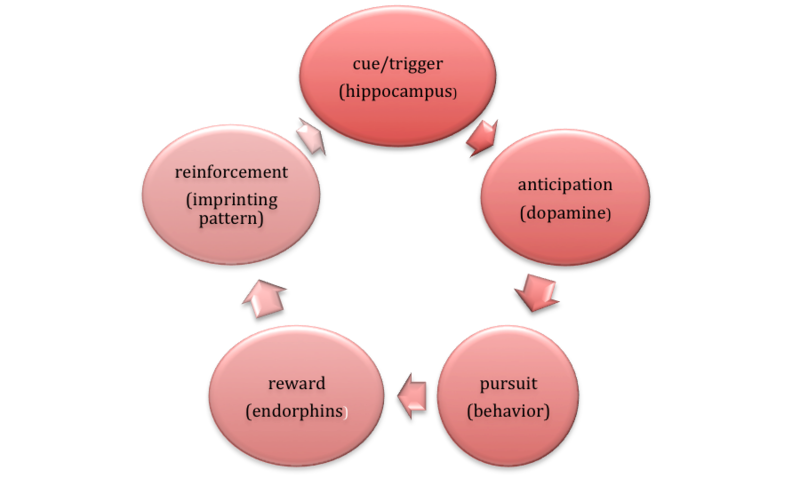 Dopamine - Can't Live Without It carried Kessler's story forward, how an addiction is formed. That graphic is my own creation, summarizing Kessler's brain science. The thing you gotta do is break the cycle that is killing you, your current die-t, and substitute another that gives you health and well being. That last post described my baby steps, preparation for the changes to come. They were experiments that changed my thinking. I know more and more about how food affects my body. My habits are getting healthier. I am enjoying these habits and new foods. Maybe I really can change. I didn't have a plan, and I hadn't reached the tipping point. I suppose everybody has one, a number on the scale, a high school reunion, a heart attack... Mine had to do with my cassock, that long black dress that priests wear. The Anglican version has a cloth cinture (Episco-speak for belt) with a velcro closure. Now, in my diocese we don't wear cassocks often. Since, in my compensation range, they are expensive, I bought one and intended never to buy another. But there I was at a funeral, in my cassock, when I sat down and the velcro on the cinture gave way. Ripping velcro is kinda loud, and not the sound you want to make during a funeral. Not to mention that the belt would fall off when I stood up again. I was not going to buy a new cassock. And, of course, I didn't do it yet. Then something else happened. A friend reached her tipping point. The doctor told her that her Body Mass Index (BMI) now qualified her for an employer-paid program that included nutrition classes with a dietician, exercise classes, and weekly monitoring by a specialist. Or, failing that, potential metabolic disorders, hypertension, heart disease, knee replacements... She chose the program. We can do it, together. This was my opportunity, to piggy-back on her program. The Stages of Change model describes preparation as the time when the person makes small changes, gathers information, explores different options, maybe visits clinics. That is everything I had been doing up to this point. If it seems that I have been writing about it for an inordinate amount of time, it is because it took a long time. And because this stage is critical. Without it, you just skip over to relapse. I am not going to recommend one particular program over another. I am certainly not going to recommend a die-t. Have you got the message yet? This is about change. My program worked because it changed the way I eat. If you die-t, when you reach your goal, you go back to the way you ate before, and the ill health it created. Action is the often shortest stage. See how this is different from the eternal and unsuccessful die-t? Kessler calls this process food rehab. He has lots of advice for implementation, and I recommend the book to you. Awareness, I was developing through my detox and smaller changes in the preparation stage. Refer back to every post I have written on this subject. Competing behavior, in my case, included logging my food, filling out what we call the bubbles. We made these slips of paper with circles for each serving of protein, dairy, fruits, veggies, carbs and fats. We planned our meals. And when each day's bubble were full, we stopped eating. In our plan, it was perfectly permissible to eat a candy bar. It was just so expensive bubble-wise that I quickly learned I didn't want a big candy bar, and I didn't want a mini one often. We learned new recipes. We learned how to shave fat, that some carbs are more filling than others, lots of tricks. That is an example, designed by a dietitian, and adapted with an eye to Terry Wahls' recommendations. It is designed for weight loss for an average height overweight woman. Adaptations are possible as long as the nutritional requirements are covered. For example, if you get your calcium from other sources, you could take dairy out and redistribute the bubbles to two more carbs and a protein. Dietitians come in handy here. I plan eating for the day. Anything is possible, as long as I plan for it and exercise portion control. A little bite can satisfy. I will eat only what I love, only what is worth the bubbles. If the cookie is mediocre, I won't finish it. Support -- that is the heart of any successful recovery from addiction. It's what I had and have, and my Facebook friends do not, not in the responses I quoted. What they have is called sabotage. I am sure the donut donor thought she was being clever. But it is painful to watch sabotage, when you know how hard somebody is trying to do something incredibly difficult. My food buddy and I planned together. We anticipated difficult contexts and strategized. We shared our difficulties and encouraged each other. When tempted to stray, each of us had the additional motivation of not wanting to lead the other astray. We had fun. We tried new things. We laughed at the ones that didn't work. We agreed that we did not have to eat the same things the other ate, because we each love our own things, and for this to work, we eat what we love. We eat what we love and what makes us feel good. Kessler spends a lot of time on this concept, replacing chaos with structure. That is what the bubbles did for us. Did you notice I said, When I reached my weight goal, I had to add bubbles to stop losing? The bubbles structure the way I eat for the rest of my life. Because, you can say it with me by now, This is not a diet. It is a change in my eating habits. Next up, depending on my technical skills, a video report on my NAMI Camino!! 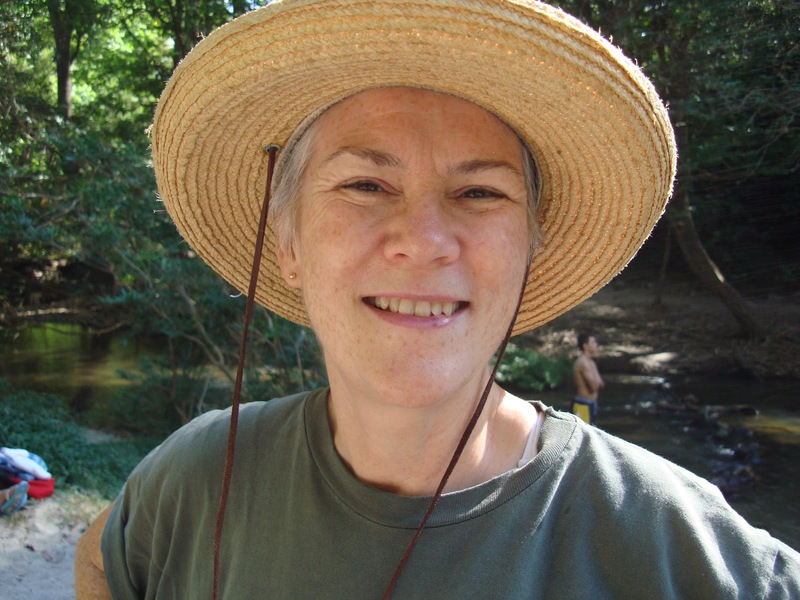 The NAMI logo in the upper right corner of this blog is a link that will take you to my walker page, where you can make a safe, secure, tax-deductible contribution to NAMI, and leave a message for me, as well. The Walk takes place on April 28. You still have time to make your pledge. The link will remain for 60 days after the Walk. Muchas Gracias! And then I'll wrap this Stages of Change thing up with maintenance and relapse stages. Dopamine -- Can't Live Without It March 23, 2012 -- The brain science behind habit formation and an experiment to try. A few years ago, I lost 60 punds by doing exactly what you're doing. I hadn't been eating much sugar or junk food, but I was overeating in general. I did the same thing you did -- I asked myself, is this really worth the calories? I found that a lot of things were not. A handful of chips, for instance, or (as you said) a mediocre dessert. I hit that relapse stage a year ago and am having a hard time getting out of it. I am looking for a new beginning. That you are reading this stuff is a sign that you already ARE beginning. Good for you! Relapse is addressed in the final post of the series, http://prozacmonologues.blogspot.com/2012/05/relapsemaintenance-stages-of-change.html#more. Basically, figure out how far down the process you have fallen. (This matters more than the number on the scale.) Then get back on at that point. Blessings on your efforts, Anon.